The 012 Series Two-Way Ball Valve compact design promotes multiple configurations to fit the exact end use application. The 012 Ball Valve Series is rated to 500 psi and will support flow and pressure in either direction. The 012 Series has a two piece body and end construction to cover 1/8" NPT end configuration applications. The Zinc Die Cast Lever Handle is standard. Handles can be ordered Reversed — to lie over the outlet when the valve is in the open position. UL configurations are available and rated to 250 psi. UR configurations are available and rated to 500 psi. The 025 Series One-Way Ball Valve compact design promotes multiple configurations to fit the exact end use application. The 025 Ball Valve Series is rated to 500 psi and will support flow and pressure only in the flow direction. The 025 Series has a one-piece body construction, stamped with directional flow arrows, to cover 1/4" NPT end configuration applications. The Zinc Die Cast Lever Handle is standard. Handles can be ordered Reversed — to lie over the outlet when the valve is in the open position. UL configurations are available and rated to 250 psi. UR configurations are available and rated to 500 psi. The 027 Series Two-Way Ball Valve compact design promotes multiple configurations to fit the exact end use application. The 027 Ball Valve Series is rated to 500 psi and will support flow and pressure in either direction. The 027 Series has a two-piece body and end construction to cover 1/4" NPT end configuration applications. The Zinc Die cast Lever Handle is standard. Handles can be ordered Reversed — to lie over the outlet when the valve is in the open position. UL configurations are available and rated to 250 psi. UR configurations are available and rated to 500 psi. The 036 Series One-Way Ball Valve compact design promotes multiple configurations to fit the exact end use application. The 036 Ball Valve Series is rated to 500 psi and will support flow and pressure only in the flow direction. The 036 Series has a one piece body construction, stamped with directional flow arrows, to cover 3/8" NPT end configuration applications. The Zinc Die Cast Lever Handle is standard. Handles can be ordered Reversed — to lie over the outlet when the valve is in the open position. UL configurations are available and rated to 250 psi. UR configurations are available and rated to 500 psi. The 038 Series Two-Way Ball Valve compact design promotes multiple configurations to fit the exact end use application. The 038 Ball Valve Series is rated to 500 psi and will support flow and pressure in either direction. The 038 Series has a two-piece body and end construction to cover 3/8" NPT end configuration applications. The Zinc Die Cast Lever Handle is standard. Handles can be ordered Reversed — to lie over the outlet when the valve is in the open position. UL configurations are available and rated to 250 psi. UR configurations are available and rated to 500 psi. The 050 Series One-Way Ball Valve compact design has a one piece body construction with stamped directional flow arrows. The 050 Ball Valve Series is rated to 500 psi and will support flow and pressure only in the flow direction. The Zinc Die Cast Flag Handle can be ordered Reversed — to lie over the outlet when the valve is in the open position. The 052 Series Two-Way Ball Valve compact design has a one piece body construction to cover 1/2" NPT end configuration applications. 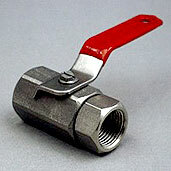 The 052 Ball Valve Series is rated to 500 psi and will support flow and pressure in either direction. The Steel Lever Handle is standard and can be ordered Reversed — to lie over the outlet when the valve is in the open position. UL configurations are available and rated to 250 psi. UR configurations are available and rated to 500 psi. The 075 Series One-Way Ball Valve compact design has a one piece body construction to cover 3/4" NPT and Garden Hose Thread end configuration applications. The 075 Ball Valve Series is rated to 125 psi and will support flow and pressure only in the flow direction. The Zinc Die Cast Lever Handle is standard. Handles can be ordered Reversed — to lie over the outlet when the valve is in the open position. The 2000 Series Two-Way Ball Valve compact design has a two-piece body and end construction to cover 1/4" NPT end configuration applications. The 2000 Ball Valve Series is rated to 500 psi and will support flow and pressure in either direction. The Stainless Lever Handle with Red Sleeve is standard. Handles can be ordered Reversed — to lie over the outlet when the valve is in the open position. The 3000 Series Two-Way Ball Valve compact design has a two-piece body and end construction to cover 3/8" NPT end configuration applications. The 3000 Ball Valve Series is rated to 500 psi and will support flow and pressure in either direction. The Stainless Lever Handle with Red Sleeve is standard. Handles can be ordered Reversed — to lie over the outlet when the valve is in the open position. The 5000 Series Two-Way Ball Valve compact design has a two-piece body and end construction to cover 1/2" NPT end configuration applications. The 5000 Ball Valve Series is rated to 500 psi and will support flow and pressure in either direction. The Stainless Lever Handle with Red Sleeve is standard. Handles can be ordered Reversed — to lie over the outlet when the valve is in the open position. The 700 Ball Valve Series is available in Two-Way and Three-Way bodies, designed to promote multiple configurations to fit the exact end use application. 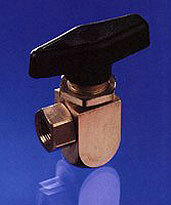 The 700 Three-Way Series can be used as a diverter or selecting valve, the bottom port is common. The handle has 180° rotation and lies over the open port. When the handle is rotated 90° from either port, flow is shut off to both ports. 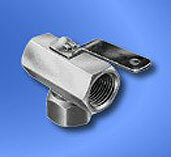 The panel mount requires a .812 hole and is supplied with one Knurled and one Hex brass nut. UL configurations are available and rated to 250 psi. UR configurations are available and rated to 500 psi. The 701 Ball Valve Series is available in Two-Way and Three-Way bodies, designed to promote multiple configurations to fit the exact end use application. 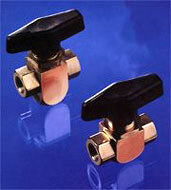 The 701 Three-Way Series can be used as a diverter or selecting valve, the bottom port is common. The handle has 180° rotation and lies over the open port. When the handle is rotated 90° from either port, flow is shut off to both ports. The panel mount requires a .812 hole and is supplied with one Knurled and one Hex brass nut. UL configurations are available and rated to 250 psi. UR configurations are available and rated to 500 psi. The 702 Series Two-Way Right Angle Ball Valve design promotes multiple configurations to fit the exact end use application. The 702 Two-Way Series will support flow and pressure in either direction. The handle has a 90° rotation and lies over the side port when the valve is open. The panel mount requires a .812 hole and is supplied with one Knurled and one Hex brass nut. UL configurations are available and rated to 250 psi. UR configurations are available and rated to 500 psi. 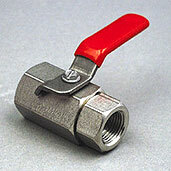 The 727 Ball Valve Series is designed to fit the exact end use in 1/8" and 1/4" applications. The 727 Three-Way Series can be used as a diverter or selecting valve. The bottom port is common and is the designated Inlet. The handle has 360° rotation and lies over the open port. When the handle is rotated 90° from either port, flow is shut off to both Side ports. The 730 Ball Valve Series is available in Two-Way and Three-Way bodies, designed to promote multiple configurations to fit the exact end use application. 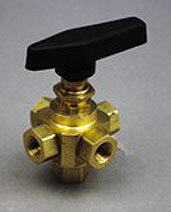 The 730 Three-Way Series can be used as a diverter or selecting valve, the bottom port is common. The handle has 180° rotation and lies over the open port. When the handle is rotated 90° from either port, flow is shut off to both ports. The panel mount requires a .625 hole and is supplied with one Hex brass nut. UL configurations are available and rated to 250 psi. UR configurations are available and rated to 500 psi. The 732 Series Two-Way Right Angle Ball Valve design promotes multiple configurations to fit the exact end use application. The 732 Two-Way Series will support flow and pressure in either direction. The handle has a 90° rotation and lies over the side port when the valve is open. The panel mount requires a .625 hole and is supplied with one Hex brass nut. UL configurations are available and rated to 250 psi. UR configurations are available and rated to 500 psi. The 734 Ball Valve Series is designed to promote multiple configurations to fit the exact end use in 1/8" and 1/4" applications. The 734 Four-Way Series can be used as a diverter or selecting valve. The Valve stem is sealed with two o-rings and Teflon® Packing. The Ball has two independent 90° holes that connects adjacent ports. The handle has 90° rotation and lies over the open port. When the handle is rotated 90° from either port, flow is connected to the alternate ports. The 734 has a large Black Nylon Knob as the standard handle.The required Panel Mount Hole is .562. The 735 Ball Valve Series is designed to promote multiple configurations to fit the exact end use in 1/8" and 1/4" applications. 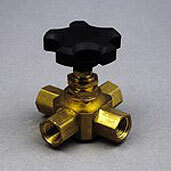 The 735 Five-Way Series can be used as a diverter or selecting valve. The Valve stem is sealed with two o-rings and Teflon® Packing. The Ball has a 90° holes that connects the bottom port with one side port, with no flow to the other three side ports. The handle has 360° rotation and lies over the open port. The required Panel Mount Hole is .562. 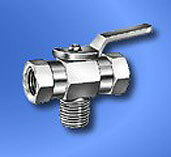 The 752 Ball Valve Series promotes a compact design to cover 1/2" NPT applications. The 752 Three-Way Series can be used as a diverter or selecting valve. The bottom port is common and is the designated Inlet. The handle has 90° rotation and lies over on of the Side ports in the open position. As the handle is rotated from 90°, there is partial flow to both Side ports. There is no complete shut-off to both the side ports at the same time.